In the 2009-11 biennial budget, Wisconsin was forced to reduce state general school aids by $147 million each year compared to FY 2009. Despite increasing poverty and rising fixed costs, the level of general aid available to Wisconsin school districts for the 2010-11 school year is roughly equal to what it was five years ago. 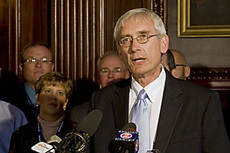 Wisconsin State Superintendent of Public Instruction Tony Evers in letters to Senators Herb Kohl and Russ Feingold in support of the Harkin Education Jobs bill. To learn more about the Harkin bill, see here and this New York Times editorial: “Saving the Teachers.” I also liked Harold Meyerson’s recent Washington Post op ed, “Deficit hawkery’s harsh impact on education” (although with most states deficits aren’t allowed and much of it is about the equally insidious budget hawkery). So there is plenty of reason and room to be talking about real tax reform that makes needed adjustments and provides necessary revenues. While on that topic, the Penny for Kids campaign is going strong. Join the thousands calling for an sales tax increase dedicated to education in order to meet the crisis and start Wisconsin back in the right direction. If you want to hit State officials too, all the info is here. Last, WisPolitics is reporting that Supt Evers also broached some school funding reform ideas around the Levy Credits (no link). Addressing the levy credits as the property tax relief they are, instead pretending that they are education aid is a great start, but much more is needed to take our state where it should be and offer a quality education to all.